Also serving communities of Monroe. There are 33 Assisted Living Facilities in the Monroe Township area, with 3 in Monroe Township and 30 nearby. 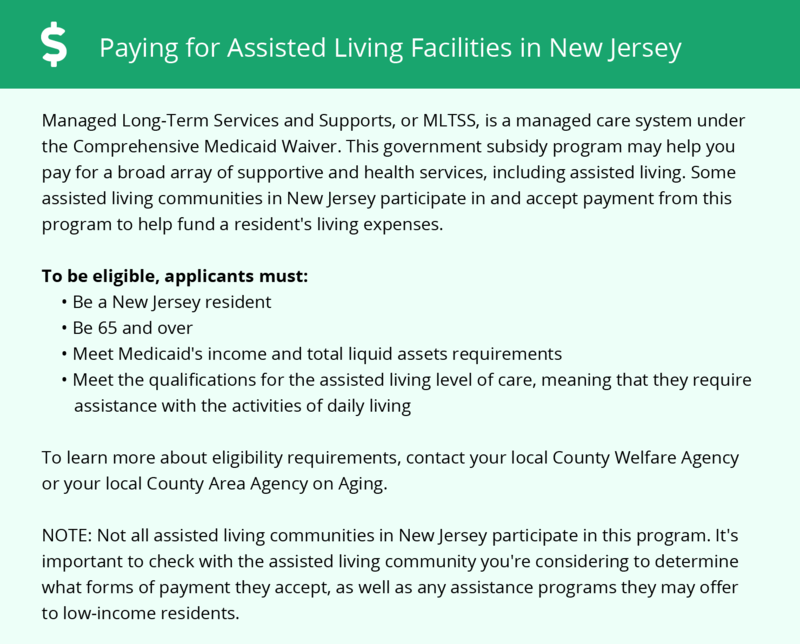 The average cost of assisted living in Monroe Township is $5,380 per month. This is higher than the national median of $3,346. To help you with your search, browse the 234 reviews below for assisted living facilities in Monroe Township. On average, consumers rate assisted living in Monroe Township 4.3 out of 5 stars. Better rated regions include Englishtown with an average rating of 4.5 out of 5 stars. Caring.com has helped thousands of families find high-quality senior care. To speak with one of our Family Advisors about assisted living options and costs in Monroe Township, call (855) 863-8283. Monroe Township provides a variety of resources and activities for adults age 55 and over, including lectures and seminars, social activities and transportation. This community is home to about 45,000 people, approximately 36 percent of whom are aged 65 and over. The Monroe Township area has 33 assisted living facilities, including three in the township proper and another 30 in nearby cities like East Brunswick and Somerset. There are three different types of assisted living facilities in Monroe Township and all of New Jersey, including assisted living residences, comprehensive personal care homes and assisted living programs, all of which are licensed by the Department of Health and Senior Services. New Jersey has some of the highest property taxes in the nation, which may affect seniors who own a home in Monroe Township. Seniors do not pay state income tax on Social Security income, and taxpayers aged 62 and over are eligible for a large deduction on other types of retirement income. According to data gathered by the American Lung Association, Middlesex County, where Monroe Township is located, has very high ozone pollution levels, receiving an F for this type of pollution. Short-term particle pollution levels are low, however, with the county being given an A for this type of pollution. The cost of living in Monroe Township is about 15 percent higher than the statewide average and nearly 50 percent higher than the national average. Groceries and utilities cost about five percent more than the national average, which may be a consideration for seniors with fixed incomes. Monroe Township's year-round temperatures are similar to the U.S. average, with summer highs in the mid-80s and winter lows in the low 20s. The region receives slightly less snow than the United States as a whole, which may make the area well-suited for seniors with mobility difficulties. Monroe Township is a very safe community, which may appeal to seniors who enjoy being out and about in the community alone. The safety index for this community is 94, meaning that it is safer than 94 percent of communities of all sizes across the country. When compared only to similarly sized communities, Monroe Township's crime rate was among the lowest at just four crimes per 1,000 residents. Monroe Township's Transportation Department operates a bus service for residents age 55 and over. This service is free to use. Assisted Living costs in Monroe Township start around $5,380 per month on average, while the nationwide average cost of assisted living is $4,000 per month, according to the latest figures from Genworth’s Cost of Care Survey. It’s important to note that assisted living rates in Monroe Township and the surrounding suburbs can vary widely based on factors such as location, the level of care needed, apartment size and the types of amenities offered at each community. 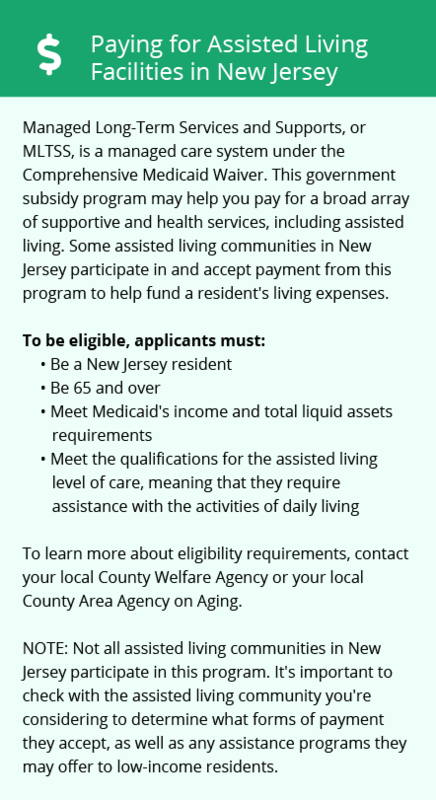 Low-income seniors in Monroe Township may receive financial aid for assisted living through the Medicaid Managed Long-Term Services and Supports program. To see a list of free assisted living resources in Monroe Township, please visit our Assisted Living in New Jersey page. Monroe Township-area assisted living communities must adhere to the comprehensive set of state laws and regulations that all assisted living communities in New Jersey are required to follow. Visit our Assisted Living in New Jersey page for more information about these laws.